Until that day arrives, however, she has dedicated herself to mastering the art of the flute. She holds tenured positions with the Santa Rosa, Marin and Santa Cruz symphonies, performs frequently with the Louisville Orchestra and recently appeared as guest principal flute with the Auckland Philharmonia Orchestra in New Zealand. Equally at home in small ensembles of contrasting styles, she is a member of Ensemble Mik Nawooj, a hip-hop/classical fusion group recently featured in the Wall Street Journal as well as Frequency 49, a female wind sextet she founded. She is also a regular performer at the annual conventions of the National Flute Association. When she’s not fluting, you may find her introducing eager, young minds to the wonderful worlds of woodwind chamber music, musicianship and music theory at the San Francisco Conservatory of Music. Her next project — the podcast Why Don’t I Like Classical Music? — hits the airwaves June 2016. Co-hosted with the brilliant musicologist Dr. Brooke McCorkle, each episode will deliver digestible morsels of music history in an accessible, conversational style. 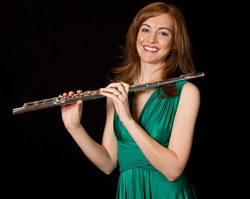 Dr. Lemoine earned degrees in flute performance from the Eastman School of Music (B.M. and D.M.A. ), where she studied with celebrated artist and teacher Bonita Boyd, and the San Francisco Conservatory of Music (M. M.), studying with San Francisco Symphony principal flute Timothy Day.​y.